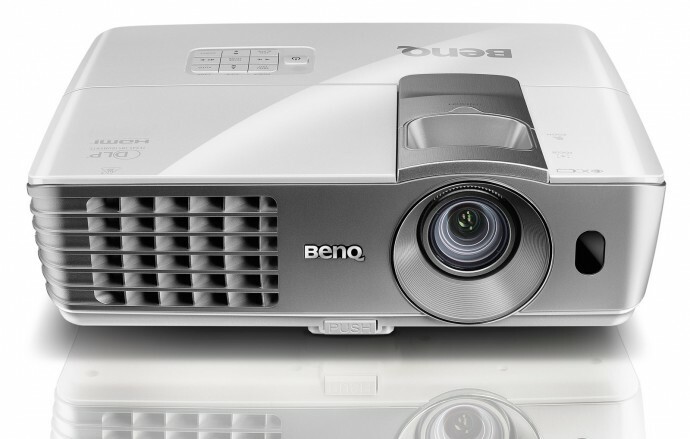 Up until recently the affordable 1080p 3D-capable consumer projectors were considered to go for about $1500 USD, but it seems that BenQ is trying to bring the price range even lower to a $1000 USD level with their new BenQ W1070 1080p 3D DLP projector. The projector is appearing on the North American market with a price of $999 USD (hence the sub $1000) and in Europe you should be able to find it for less than 900 Euro. Aside from the W1070 version, BenQ also has a short throw model called W1080ST with the same specifications as the W1070 including 3D support, but with a short-throw lens. Of course the price of the W1080ST will be over $1000 USD, more like $1299 when it becomes available in the beginning of 2013. Both models are going to be interesting because of their affordable price among the home users with more limited budgets that want to be able to play Full HD 3D movies at home and even be able to play games in stereo 3D mode at 720p resolution. The lower resolution for stereo 3D gaming is caused by the fact that these 3D-capable projectors from BenQ are based around HDMI 1.4 frame packaging, though they apparently will also support Frame Sequential, Top-Bottom and Side-by-Side 3D modes across most interfaces. Both projectors are also officially compatible with Nvidia’s 3DTV Play software (using HDMI 1.4), but not officially compatible with 3D Vision (though up to 1280×800 the projector should be supported in frame sequential mode with up to 120Hz), so you will not be able to use the 3D Vision active shutter glasses and will need to go for DLP Link ones (not included in the standard price of the projector). If you are looking for a 3D-capable projector that is going to be used mostly for gaming and the 1080p mode is not a requirement, then you might want to check out the BenQ W700 or W710ST (short throw version). These two are 720p 3D DLP projectors that use HDMI 1.3 interface and support 3D over frame sequential mode only, they are official 3D Vison ready devices that can be used with either 3D Vision active shutter glasses or DLP Link ones. The new BenQ W1070/W1080ST models support 1080p 3D mode only at 24Hz which is good for 3D movies, but not for gaming in stereo 3D mode, so even with them you will have to get down to 720p resolution. And using the HDMI 1.4 frame packaging mode for the 3D instead of frame sequential mode tends to increase the input lag and that is something you’d want to avoid as much as possible when talking about gaming. If you were waiting for a more affordable 3D-capable DLP projector that can provide you with native 1080p resolution, than Optoma might have just the right thing for you, their new Full HD 3D projector with model number HD33. Most certainly Optoma HD33 is not the first Full HD 3D projector out there, however it is the most affordable one that combines the high resolution with 3D support and that is actually the most interesting thing. The end user price of the Optoma HD33 should be about $1,499 USD, and that is something very attractive indeed considering that most other more-affordable alternatives with similar features are at least twice or even three times more expensive. Now, before getting too excited about being able to play games in Full HD resolution in stereo 3D mode on your PC, I should make it clear that this projector (like most other such) relies on HDMI 1.4a interface, something that is both good new for some users and not so good for others. Since the Optoma HD33 projector does not feature a Dual-Link DVI interface you can forget about being able to use it with 3D Vision for gaming in stereo 3D mode at 1080p resolution. The projector might however get added as a supported product in the 3DTV Play software, however it will not be compatible with the 3D Vision active shutter glasses. You’ll need to use a pair of DLP Link active shutter glasses or Optoma’s new BG-3DRFGLASSES 3D-RF glasses (actually looking exactly like Monster Vision Max 3D made by BitCauldron). Apparently the projector has been developed for entertainment purposes, Blu-ray 3D movie watching or for console gamers willing to play in stereo 3D mode for example and not with PC gamers in mind. The HD33 should support all the HDMI 1.4a mandatory 3D formats, including of course the most commonly used Side-by-Side and Top & Bottom formats, and to further enhance 3D compatibility, Side-by-Side and Top & Bottom formats can be manually enabled to allow other non-HDMI 1.4a compatible devices, such as older set top boxes, Xbox 360, or PCs to display 3D via the VGA or HDMI ports. The HD33 projector offers two HDMI 1.4a ports, one VGA port, as well as connections for component video, composite video, RS-232, a +12V trigger, and a VESA 3D Port. The maximum brightness offered by Optoma HD33 is 1800 ANSI lumens and the contrast ratio is 4000:1, the projection lamp is rated to last up to 4000 hours in standard mode or 3000 hours in bright mode. There are a lot of people that expect this year to finally see 1080p 3D-capable projectors on the market with more affordable prices, thinking about upgrading their current 720p 3D projectors or directly going for such a solution with gaming in stereo 3D mode as one of the main things to do on a big screen. Currently one of the most affordable 1080p 3D projector is Sharp XV-Z17000 available for about 3-4K USD , but even this is considered high for more mainstream users not looking to build a home movie theater, but instead planning to use the projector for gaming. Especially considering that there are some mainstream 3D-capable 720p projectors such as the Acer H5360 available for just about $600 USD , so paying 2-3 times that price for a projector supporting 3D and 1080p resolutions sounds reasonable, but more not so much. Leaving the still higher price for 3D support and 1080p resolution as features available together in a projector, there are some other important things that you should consider if you are looking to buy an 3D Full HD projector for gaming. Having an industry standard such as HDMI 1.4 is good for a lot of things, but can also bring some issues because of some limitations it implies on hardware that is using it. And you can expect pretty much any 3D-capable 1080p projector for consumers that is expected this year to be based on that particular standard. For movie lovers that should not be a problem as the HDMi 1.4 standard supports high enough bandwidth to push 1080p at 24Hz in 3D mode, but for gaming in stereo 3D mode this is simply not enough and you should go back to 720p resolution where you can get 50 or 60Hz per eye in 3D mode. So what is the point in going for a 1080p 3D projector using HDMI 1.4 if you plan to use it for gaming – absolutely no point in doing that. You better stay with a much more affordable 720p model if you have one or go for such 3D projector for playing games in stereo 3D mode, and you can of course play 3D movies in 1080p resolution on it without very significant visual quality “loss”. In 720p resolution you would have to use some Anti-Aliasing to smooth the jagged edges in games, something like 4xAA should be quite close to what you get at 1080p resolution without AA in terms of edge smoothness, although there would be still some difference in the level of details you get. But in general playing at lower resolution may also help you get by in stereo 3D mode even with not a top-end video card with a decent framerate as compared to playing with the same hardware on 1080p display for example. And having a bigger projected screen helps a lot for the immersion as compared to a much smaller 3D monitor for example that may have higher resolution, not to mention the fact that 3D DLP technology is practically crosstalk/ghosting free in 3D mode. Having a 3D-capable projector using HDMI 1.4 has the advantage that it should be compatible with much wider range of hardware, not only PC (Nvidia’s 3D Vision and AMD’ HD3D technology), but also standalone consumer electronic devices with support for 3D such as the PlayStation 3 console, or a Blu-ray 3D player. The disadvantage when using HDMI 1.4 is that it only supports 720p 50/60Hz 3D mode and 1080p 24Hz 3D mode, the rest is only in 2D mode and you cannot use the projector at 120Hz in 2D mode like you can do with projectors using HDMI 1.3 or VGA interface for example (this can vary greatly on the specific projector).